At the end of a long day of work, at the office or in the yard, nothing melts away the stress like soaking in a hot tub or spa. Stargazing while the jets massage the tension away, and all of your worries just fade away. At least until it starts raining or your head gets bombarded with gnats, mosquitoes and other bugs. With a Global Solarium sunroom or spa enclosure, you can get back to relaxing, protected from whatever Mother Nature has to offer. There are other reasons for enclosing your sunroom as well. A lot of energy is used to keep the hot tub at the optimal soaking temperature. While hot tubs have covers, very few are truly airtight, let the warmth escape and letting cool air in when not in use. With a hot tub enclosure, the heat remains in the place, colder air is kept out, and the hot tub won’t have to work as hard. This means less energy is used, saving you some money each month. The hot tub returns the favor, warming the enclosure when it’s in use. Increased privacy is another plus for the hot tub enclosure. 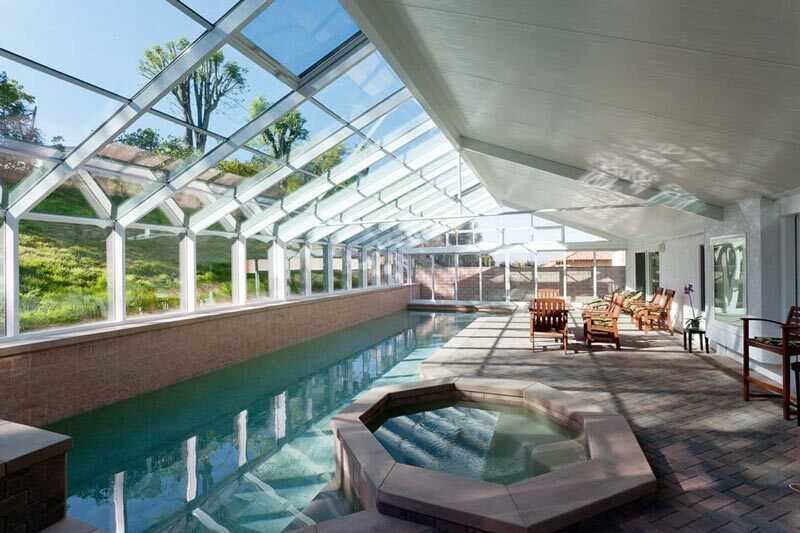 Depending on the glass you use in your sunroom, you will be able to enjoy your hot tub without putting on a show for the neighbors. Additionally, small animals may be drawn to the warmth of the hot tub in the cooler months and may look for ways to get underneath the hot tub. An enclosure will put an end to that as well. Finally, a spa enclosure will let you enjoy the hot tub all year round. Making your way to the hot tub while it rains is one thing, at least you can wear a robe and insulated boots on the way. Once inside the enclosure, your boots, robe and towel will remain dry no matter the weather. Global Solarium enclosures are not only built to withstand the weather, but the moisture created by the hot tub as well. A little bit of humidity is no match for the vinyl interior, and vented or sliding windows will allow for as little or as much fresh air as you desire. 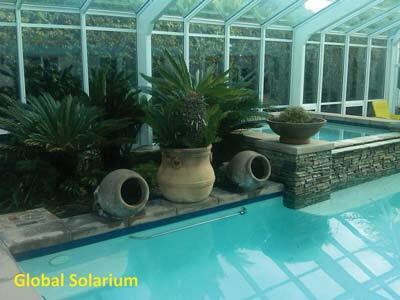 If you have a spa or hot tub and are thinking about adding an enclosure, or are thinking about installing both at the same time, contact Global Solariums today. We have the experience to make sure the floor is strong enough to handle the extra weight of a hot tub as well making sure all the needed power has access to the spa. Then you’ll be able to wash away the worries without being bothered by Mother Nature.